Did you know that sapphire is the official birthstone for September? 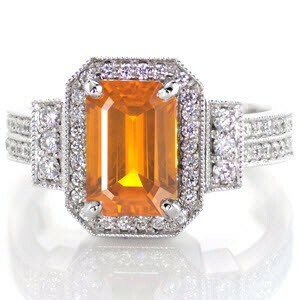 This gemstone has captivated the world for centuries and has long been associated with royalty, wealth, and religion. In fact, the stone is given as a gem for the 5th wedding anniversary. 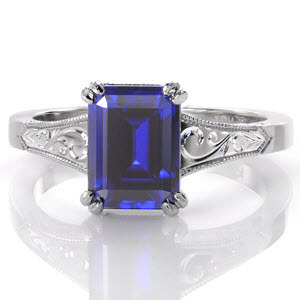 By the end of this short article, you’re going to find out everything you ever wanted to know about sapphires and how you can create the perfect birthstone engagement ring or custom jewelry with Knox Jewelers. 1. Sapphires don’t have to be blue! Sapphires are known around the world for their vibrant blue color. However, this gemstone is characterized by any corundum (a type of mineral) that doesn’t qualify as a ruby and isn’t red in color. It’s a little-known fact that sapphires can be gray, orange, purple, yellow, and even black! 2. Sapphires are associated with royalty. Sapphires symbolizes truth, faithfulness, nobility and sincerity and for centuries have been associated with romance and royalty. The world’s most famous sapphire? Perhaps the one in Princess Diana’s engagement ring – given to her by Prince Charles. Because of this, sapphires evoke connotations of fairy tale and royalty. Sapphires made the news again when Prince William gave this then-fiance Kate Middleton an engagement ring with the mineral – just like his father did more than 20 years before. 3. Sapphires have an illustrious history. Despite its connections to modern-day royalty, sapphires have long been associated with monarchs throughout history. 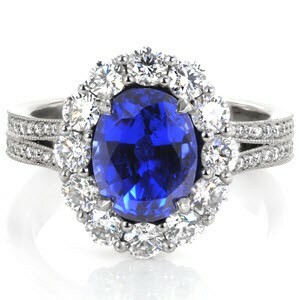 In fact, kings and queens believed that blue sapphires protected them from harm in ancient Rome and Greece. In the Middle Ages, priests would wear sapphires – the mineral was an instantly recognizable symbol of heaven. Even today, people wear sapphires to protect them from spirits or enemies – making this birthstone one of the most popular in the world. 4. 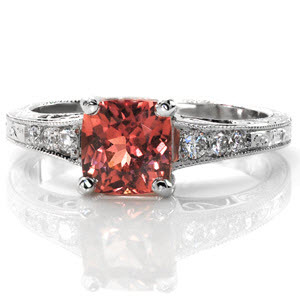 Orange and pink sapphires are among the most rare. Different colored sapphires are becoming increasingly popular, especially those which are found in Sri Lanka. These sapphires range from light to medium tones of orange and pink and instantly catch the eye. These vibrant gems carry the name Padparadscha, meaning color of the Lotus Flower in Sanskrit. This shade of sapphire is among the rarest natural colored sapphire. 5. Sapphires are really strong. Not a lot of people know this, but sapphires are really strong. In fact, they are the strongest natural gemstones in the world – second to diamonds. These gemstones can be found in various locations around the world, including Cambodia, China, Australia, Kashmir, and Madagascar. 6. Blue sapphires are still the most sought-after. Despite sapphires coming in a wide range of colors, the most popular are still those with a concentrated blue hue which stays consistent under different lighting conditions. This gemstone is often given as a gift to friends, family members and partners for special occasions and is seen as being extremely valuable in various cultures and countries around the world. 7. Sapphires have been found in large sizes. Most sapphires mined today weigh under two carats, but larger gems can be found. The Millennium Sapphire is the world’s largest polished and cut sapphire, weighing a whopping 61,500 karats! Many large sapphires are kept in museums in cities around the world. 8. Synthetic sapphires are sometimes used in jewelry. This September birthstone can also be created synthetically – the first being in 1902. These can be difficult to distinguish from natural sapphires by the untrained eye, and they are often used as an alternative in jewelry. 9. Color-changing sapphires actually exist! Color-changing sapphires do actually exist and display different hues in various lights. 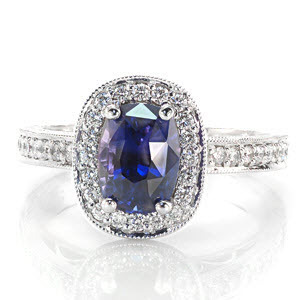 Color change sapphires appear blue when in natural light but a violet color in artificial light. Most natural sapphires undergo heat treatment to improve their clarity and color – a practice which can prevent the birthstone from chipping or breaking. Looking for a unique engagement ring that will wow your partner? A piece of jewelry that will make the ultimate gift? You’ve come to the right place! Knox Jewelers specializes in unique custom jewelry and engagement rings, including antique designs. We pride ourselves on the customer service we provide and offer lifetime warranty, maintenance services, and trade-in. We can search for sapphires in every color imaginable, which can add some sparkle to an engagement ring or jewelry piece. 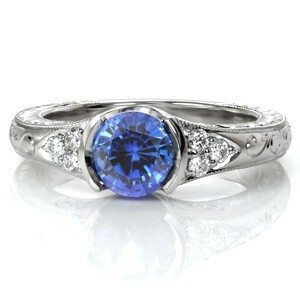 If sapphire’s not your thing, we can custom create rings in every shape, size, and type of gemstone. So, what are you waiting for? Contact Knox Jewelers today for more information about our custom jewelry and engagement rings.